It’s becoming a tradition: a reporter pulls me aside at the end of an SAP show and asks, “There wasn’t really much news, was there?” No, and yes. BI 4.0 excepted, the most compelling SAP software releases of 2011 are looking like fall/winter timeframes. But there was plenty of “real news” to be found at Sapphire Now. The important stories were on the ASUG co-location side, where views towards SAP technical virtuosity are more nuanced – and sometimes downright skeptical – compared to the (ahem) “game changing” proclamations we heard from the main stage. Perhaps most striking: during the show, SAP pulled off a shift in emphasis that surprised many who follow the company closely. 1. SAP is grappling with the changing nature of influence. Ask different players in the SAP ecosystem “Is SAP listening?”, and you’ll get maddeningly different responses. I posed that very question on video to Michael Doane, a leader in the movement to reframe SAP cost of ownership in business terms via “Centers of Excellence.” His answer? A flat-out “no.” The European user group members on-site for SUGEN meetings also had strong words for SAP, some of which Dennis Howlett and I captured on video. Within the blogger program I participate in, it’s a different story. Both Howlett and Vinnie Mirchandani have already documented the talks a small group of bloggers had with four of SAP’s highest ranking executives. The conversations were not only frank, they skewed towards bloggers talking and SAP listening. These friendly-but-jugular exchanges with Jim Snabe, Bill McDermott, Hasso Plattner and Vishal Sikka convinced me that SAP has a good handle on the plan it is executing and the obstacles in its path. Execution is another story. But for SAP executives to welcome in a group of independent-minded bloggers who are not known for their gentle views speaks volumes. The blogger program that made this possible is one of the jewels of SAP’s effort to change how it engages. 2. SAP got the message – and let the customers carry it. Prior to Sapphire Now, SAP heard from influencers that they needed to get customers front and center. Interim (hopefully that “Interim” part will be dropped and soon!) Chief Marketing Officer Jonathan Becher and team pulled off a conference with a genuine customer focus. Though the keynotes weren’t perfect – Tuesday’s talk show format never quite flowed and the Hasso Plattner speech extended into the professorial – there were customers front and center throughout. Even Plattner’s keynote featured numerous customers – I lost count around 13. (keynote and other replays are available with free registration/log-in). A more extreme example of the customer-centric focus? In several cases, SAP left Dennis Howlett and I alone with Business ByDesign customers and our cameras, the end result being videos we are in the process of posting on JD-OD.com, such as this Pinkberry customer interview. To step out of the room during a customer video shoot is a daring move that underscores SAP’s confidence in its customers and its influence strategy. And that tweet was on May 17, the day before Hasso Plattner’s “13 HANA Questions” keynote session. Is SAP really betting the future on HANA? SAP is certainly staking a big part of its future on in-memory. In-memory has implications beyond HANA, including the news that all Business ByDesign customer data will eventually reside in-memory for improved performance (ByD currently uses in-memory for analytics functions). In our blogger meeting with Plattner, he emphasized the same radical futures, acknowledging that the entire SAP Business Suite could eventually be retooled, at minimum moving the CPU-intensive aspects of the Suite into in-memory, thereby providing the latest answer to the age-old “will SAP rewrite the Business Suite?” question. No, the answer currently goes, but SAP will streamline the Suite via in-memory, enabling “RESTful” enhancements on top of the Suite via Gateway, a key product which is targeted for General Availability in October. SAP Board Member Vishal Sikka’s Wednesday keynote echoed the same “HANA changes everything” themes: “You will see us revolutionize the entire product portfolio based on this.” This is a new way forward for the Business Suite, a far more viable plan than those legends about chopping the Business Suite into components or moving the entire monster code base into the cloud. 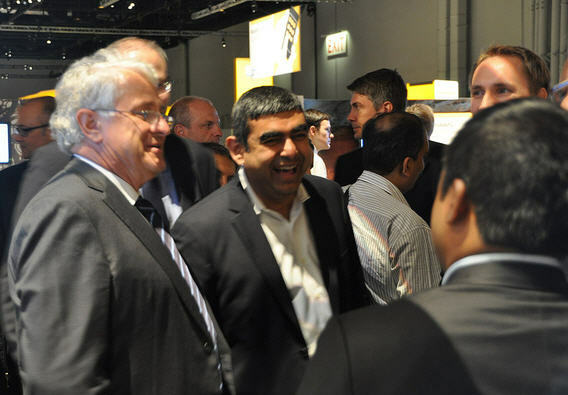 Hasso Plattner and Vishal Sikka, photo by Martin Gillet. As recently as last December’s Influencer Summit, SAP’s message was “on-device/on-premise/on-demand,” with a healthy dose of BusinessObjects “insight.” That focus hasn’t changed. SAP still intends to make 25% of its revenues from analytics and mobility products by 2015, and one of the more important announcements from the conference was the Amazon cloud news (see “SAP Certifies Amazon Web Services for Half of Its Application Portfolio, Core ERP on Deck“). But: “real-time computing” via in-memory is now SAP’s fundamental message. This shift isn’t hard to understand: if HANA lives up to its promise, it combines a big reduction in data warehousing expenses with “real time” information access, particularly in high transaction areas with business impact, such as sales lead/order analysis. Industry-specific use cases such as crunching clinical trials data were also on display at the show. 4. HANA may be a game changer, but not to all customers. I came to Sapphire Now troubled by the discrepancies between the hefty sales pipeline co-CEO Bill McDermott cited on the most recent earnings call (and re-iterated at Sapphire Now) versus the much more guarded takes I’ve heard from colleagues who have looked under the HANA hood and come back with mixed reviews. However, during our blogger session with McDermott, he expressed confidence in hitting the HANA sales targets they have set internally for the year. Those sales goals amount to what McDermott’s team believes is a closeable percentage of the overall sales pipeline numbers he has cited publicly. The explanation for these divergent HANA views? I believe it lies in the fact that for big ticket HANA customers (the ones SAP is likely targeting now), it won’t take that many sales to add a boost to SAP’s 2011 revenues. Still, the differences in HANA viewpoints between the stage and the show floor were striking. There is lingering confusion, not just in terms of the future of BW, but how “ready” HANA is right now. I had one reporter ask me after Plattner’s keynote, “You mean, those customer examples weren’t in production yet?” The answer – not that I know of. I have yet to talk to a HANA customer that is out of the proof of concept phase. For the customers I have spoken to (including Lenovo, the China-based HANA customer featured in the keynote), the work remaining is both internal (building a business case) and external, co-innovating with SAP on product improvements, such as improved querying and better integration. A different customer viewpoint came from Ed Herrmann of the Enterprise Geeks, who gave a favorable review of what he heard about HANA’s compression capabilities on the Enterprise Geeks Sapphire Now podcast. Example: 100 Terabytes cut to only 40, thanks to hot and cold storage, then that 40 terabytes compressed to an affordable 1 or 2 terabytes. However, in his blog series on SAPPHIRE NOW, fellow SAP Mentor Vijay Vijayasankar questions whether compression can have that kind of impact on already compressed data. In his blog post, Vijay also stresses a distinction between “right time” and “real-time”. As he points out, until HANA is running directly on operational data and showing split second results in productive instances, “real-time” is still on the future roadmap, still more buzzword than reality. Fortunately for SAP, real-time data is not necessarily its customers’ biggest issue. Getting that data to the right people at the “right time” is generally the key challenge. Despite the 13 HANA questions Plattner tackled, more are popping up. That said, HANA has now taken center stage in SAP’s determined effort to reclaim not only its market mojo but its enterprise thought leadership. Perhaps most important to the ASUG customers on hand, SAP is now taking backwards compatability as a mantra. After several years of showing off technology that could only be accessed via a painstaking ERP 6.0 upgrade, SAP is making two of its crucial new products, HANA and Gateway, compatible with all ERP releases back to 4.6C. With the news that HANA pricing will be rolled out with “small, medium, and large” appliance options and, more than likely, some flexible pricing models, SAP is clearly looking to make HANA a factor for a wide range of customers, not just the deep-pocketed flagships. Taken with the Sapphire Now announcement that “HANA in the cloud” is also in the works, SAP is doing its darndest to breathe life into that exhausted phrase “innovation without disruption.” Whether it succeeds will depend on several factors I will examine in part two of this piece. Note: SAP covered my travel and accommodations to this event. For more on HANA, I recommend Ethan Jewett’s SAP HANA and ‘The Overall Confusion‘ and Chris Kanaracus’ HANA FAQ. I also filmed a HANA wrap video at Sapphire Now that will be appended to this blog post when it is produced. Feature photo and “Hasso and the SAP Mentors” photo below both by Martin Gillet, SAP Mentor and event photog extraordinaire. Interestingly enough in off the record conversations with a number of SAP employees, internally SAP appears to be split on HANA. Some employees see it as Hasso and Vishal baby with the company living or dying on its future. Questioning it could cost one job security. From a customer perspective I’ve no interest in HANA, seeing as nothing more than a overpriced proprietry hardware solution. The most inexpensive version offers 2x compression with little performance gain. Similar query speeds can be gained with hardware improvements that cost far less. Thanks for the comment. Some of the dischord about HANA you are describing is what I was trying to capture in this piece, though obviously your experiences are different than mine. I do think in-memory is going to ultimately have a positive impact on enterprise applications (Workday being a well known example of a company that has gotten good reviews on their use of it), but who the “winners and losers” of that are going to be from a vendor perspective has yet to be determined. As for customer value, I’ve definitely talked to some SAP customers who are excited about HANA, some who are cautious but interested, and some who are more indifferent in that they are focused on other priorities right now. This is one of those stories I think where there’s only so much you can say about it now – in a couple years we’ll have a much clearer view.